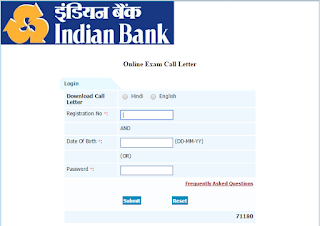 The Latest News is Indian Bank has released online admit cards on official website for eligible candidates who had applied online for online written examination which is going to be conducted on 24th May 2015 at various centres for the posts of Manager/ Assistant Manager Post under specialist officer cadre. Candidates must remember that it is mandatory to bring their admit card printed copy along with photo identity proof of the candidate. Only Adhar card or PAN card is valid as photo identity proof of the candidate. No candidates are allowed without having these two cards (admit card/ identity card). Late coming candidates will not be allowed to the examination hall. Candidates are advised not to bring any other item expect these to the examination hall. 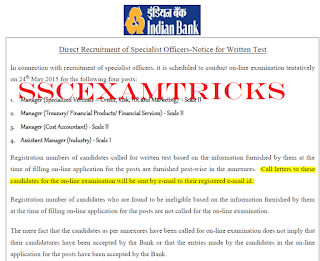 It is advised to the candidate to read all the instruction carefully provided below the admit card before appearing in the written examination. 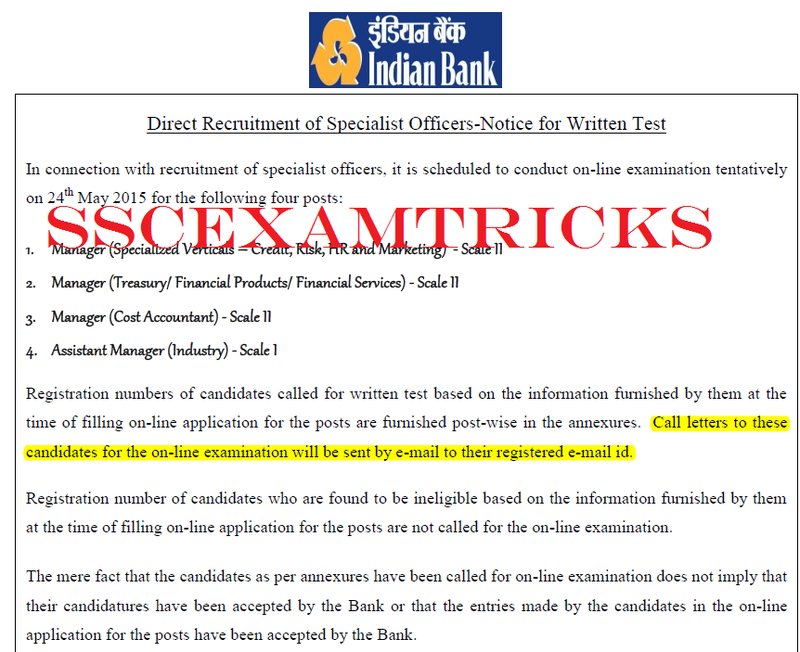 Those candidates who had applied for these posts can download their admit cards for screening test / written examination from the direct link provided below. Indian Bank, Chennai a public sector Bank state-owned financial services company has total 2100 no. of branches & 19000 no. of employees and also has 229 correspondent banks in 69 countries. The Bank has overseas branches in Colombo, Jaffna, Sri Lanka, and Singapore. The IB SO EXAM 2015 will be conducted on 24th May 2015 by Online Mode. 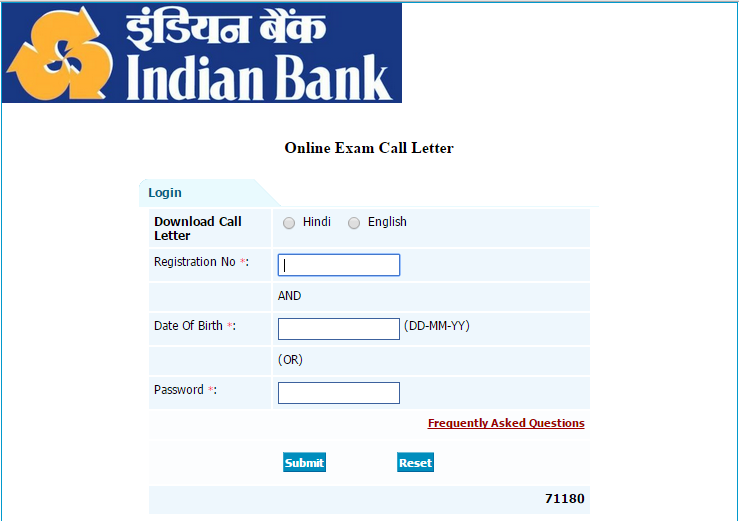 In ONLINE Mode, the exam will entertained through filling of circles on Computer by clicking circles on Computer. There is no OMR sheet will be filled by Blue/Black ball point pen. The exam consists of various sections contains questions of English, Reasoning, Quantitative Aptitude, General Awareness and Computer Knowledge. The exam will be a multiple choice question paper of 200 questions of 200 marks in which four options are provided out of which candidates need to choose one correct answer. The time duration for exam will be 2 hours or 120 minutes. There will be negative marking for any wrong answer.